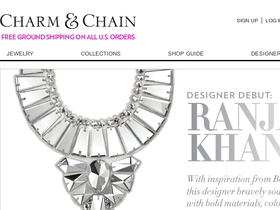 Shop Charm & Chain online at CharmandChain.com for unique and stylish jewelry at affordable prices. Charm & Chain prides itself on finding beautiful wearable art to give your outfit just the special touch it needs. Charm & Chain offers bracelets, earrings, rings, necklaces & brooches in a wide variety of styles. Save on your next purchase from CharmandChain.com with discounts, coupons, promotions and savings from 58coupons.com. Hurry on over to Charm & Chain to save up to 50% or more on select sale items. Click link. CharmandChain.com has designer earrings on sale for as low as $50. Click link for details. Turn a so so outfit into a real stunner with these gorgeous seedbead fringe chockers from Charm & Chain at 20% off.